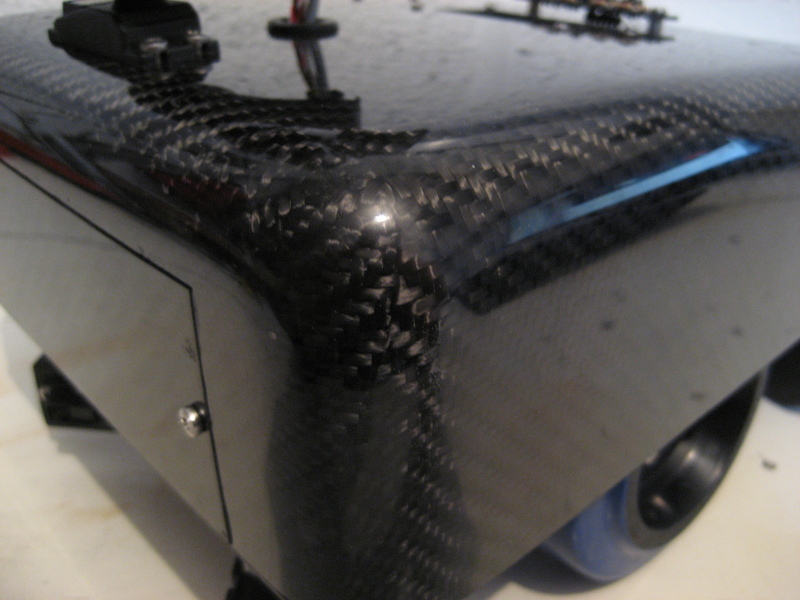 As mentioned in my last post, I have been hoping to have a custom carbon fibre shell made for my robot for a while now, to replace the aluminium shell. That time has come! I have a friend who has been making carbon fibre parts for a while now and he kindly offered to make a part for my robot. The first step was to create a model of the part I wanted, which I did myself. I used styrofoam (blue) to create a model of the shell of the exact size required. I used hot glue to stick several bits of styrofoam together to give me a rough shape. This was then shaped by hand using sandpaper to leave the final shape required. The shaping involved rounding the corners and ensuring the top of the shell was as smooth as possible. 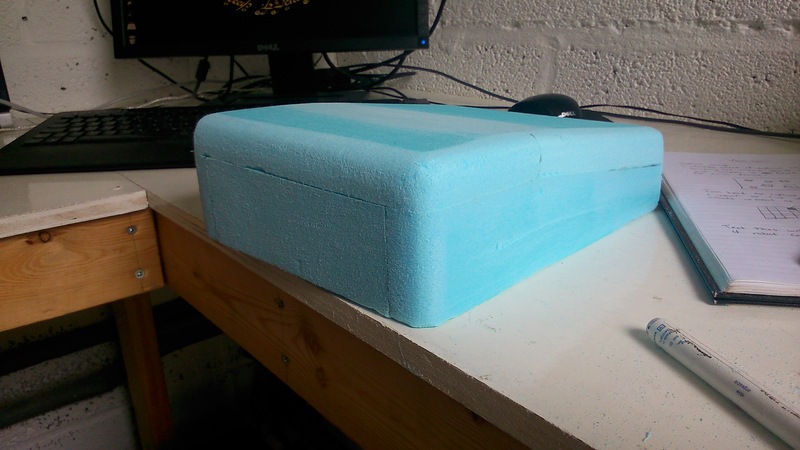 At this point the styrofoam model was given to my friend who spent quite a bit of time getting it ready to use to make a mould. This process included sealing the part with epoxy resin, covering it with body filler and sanding it to shape and several coats of a special resin designed for pattern making that can be sanded and finished to a high standard. A mould of the part was then made that could be used to make the carbon fibre part. The carbon fibre part was made and given to me ready for fitting to the robot. I completely dismantled the robot to allow the new shell to be fitted. I had to round the corners of the base plate to match the rounded corners of the shell. 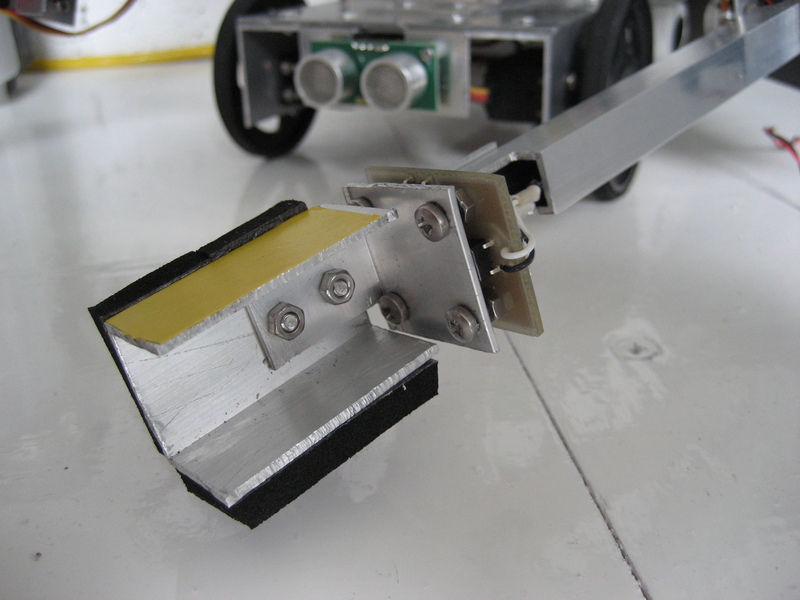 I fabricated some angled brackets to attach the shell to the robot, which were fixed to the shell with epoxy resin. I had to cut the carbon fibre shell to accommodate the head servo, the TFT screen and an access panel at the front and rear. I fabricated some additional brackets to hold the access panels on to the shell, and also attached these with epoxy resin. To protect the lovely shiny surface of the carbon fibre shell, I cocooned it in masking tape before any cutting or drilling took place. With the shell finished I rebuilt the robot, mounted all the parts to the shell and fitted the shell to the robot base. Take a look at the finished product! 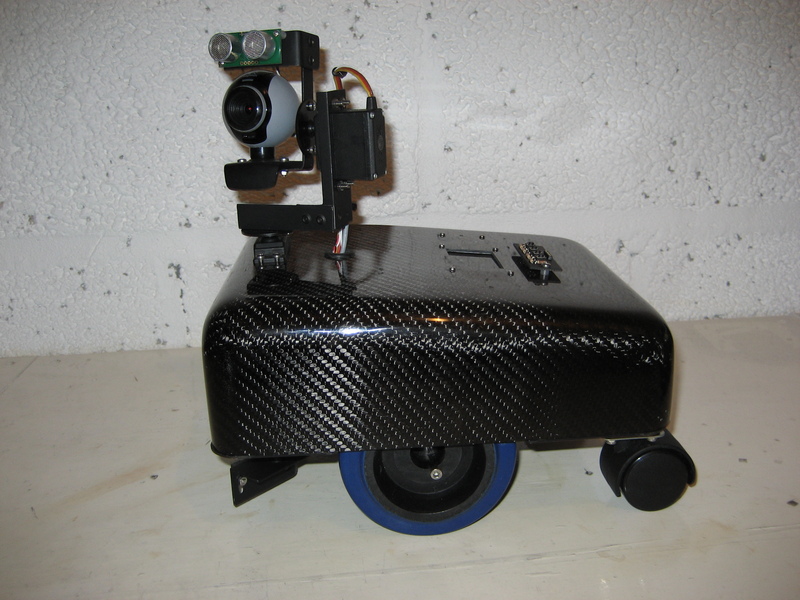 I am very pleased with the look of the robot with the carbon fibre shell and it is very tough. The other advantage is that the shell is now very light. I weighed all of the aluminium parts of the old shell that I took off and they weighed 750g. The carbon fibre shell weighs in at 260g. This is a considerable weight saving, especially for a robot driven by modified servo motors and should reduce load on the servos and extend battery life. 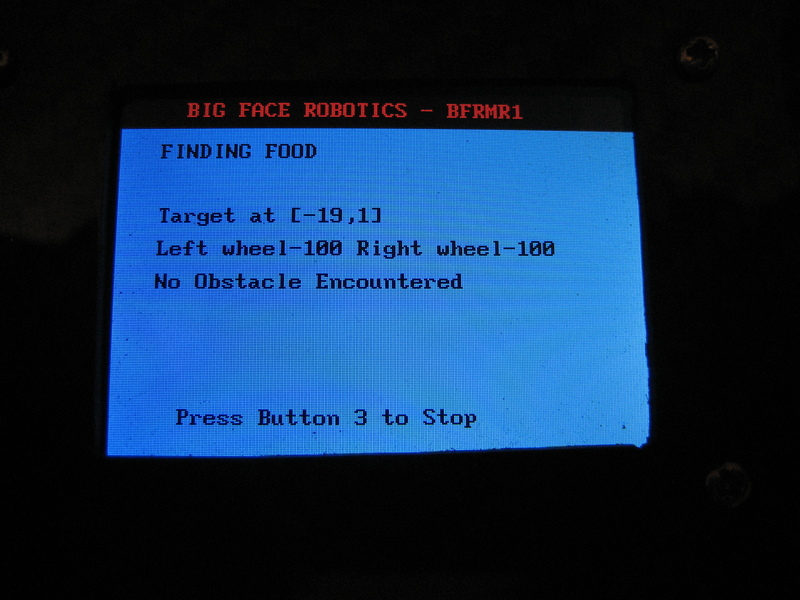 I have also been working on the software for the robot. I have modified the way the Arduino and the Raspberry pi interact and I have tried to move some of the real time processing to the Arduino. As such, the Raspberry pi now sends commands to the Arduino, via serial, to instruct the robot to carry out a particular movement. This could be move the head to a given position or drive forward/turn a certain distance. When the move is complete the Arduino then returns a packet of data containing up to date sensor readings. On top of this the Arduino is also monitoring the sensors as the robot moves, detecting potential collisions and stopping the robot if necessary. The Raspberry pi can inspect the returned data packet to check if the robot moved the required distance and if not, check which sensor triggered and act accordingly. This allows much more accurate control of distances moved and sensor thresholds to stop the robot and frees up the pi to do other tasks if required. 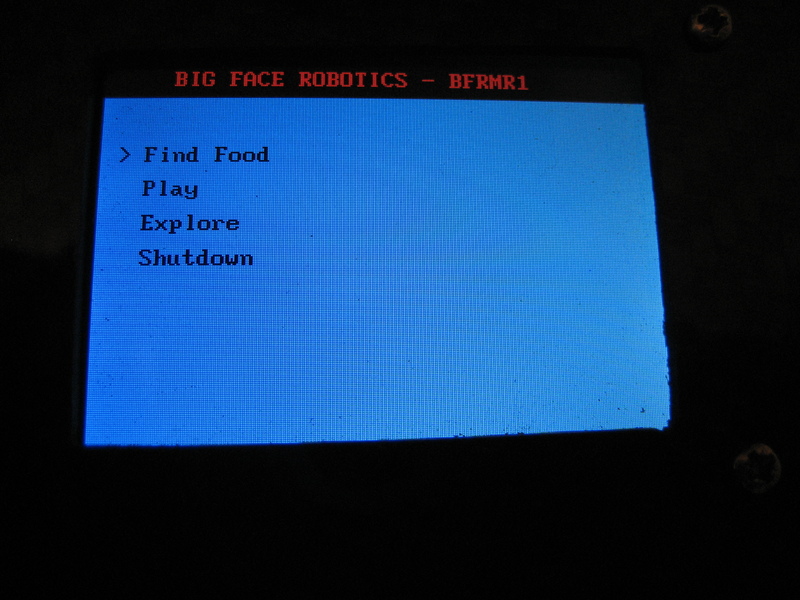 I have also been playing with the TFT display, nothing particularly special at the moment but I can switch between modes and start and stop the robot using the buttons, and display the status on the screen. Some pictures below. I am currently improving the obstacle avoidance code and working on some basic behaviours for the robot. One of which, as shown above, is finding food mode. My idea is that the robot will search out objects of a certain colour which it will identify as food. It will then navigate to the object to satisfy its hunger. Other modes such as play may involve the robot looking for a ball or similar object. When I am happy with the obstacle avoidance mode of the robot I will make a video, stay tuned! 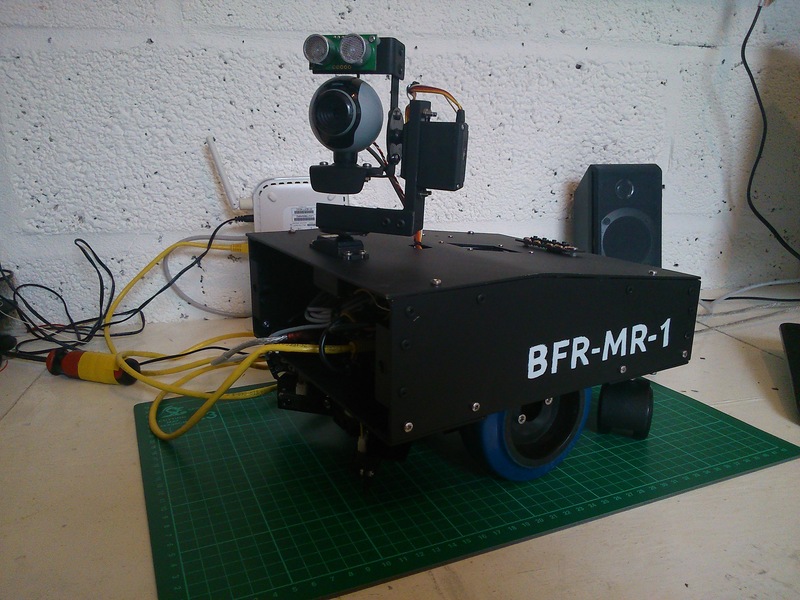 I realised that the design of my robot didn’t meet one of my initial goals for the project. Although a sturdy and reliable design, most of the components were still on show and the design didn’t make it easy to add a cover to enclose the electronics. I redesigned and made a new base plate for the robot. The brackets that fix the servos for the drive wheels to the base were moved from the top of the base plate to the bottom. This freed up some space on the top of the base plate and gave the robot a much bigger ground clearance. The Raspberry Pi, Arduino and batteries were then fixed to the top of the base plate. I could then fabricate an enclosure to cover everything. I made separate sides, top and front and back to the enclosure out of aluminium sheet. 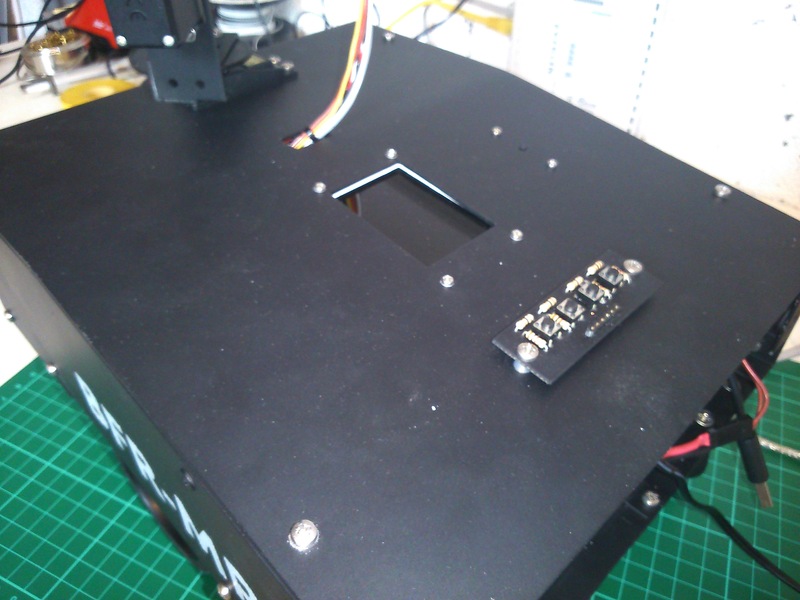 The head pan servo was mounted in to the top of the enclosure, reusing the pan/tilt camera mount from the previous robot design. I had to fabricate some spacers for the rear castors and the IR sensor bar to space everything off the base plate correctly. I also treated myself to a small TFT screen (Adafruit 2.2″ TFT) that is mounted into the top of the enclosure. Combined with a home-made array of tactile switches this means I can start/stop the robot or switch between modes without connecting to the robot with another computer. The front and back of the enclosure had to be removable to access connectors and batteries for charging. A coat of paint and the robot was ready to go. This design keeps a lot of the electronics tucked away whilst still allowing access to the necessary connectors with the ends of the enclosure removed. I like this design but I would still like to replace the aluminium enclosure with a custom carbon fibre one. 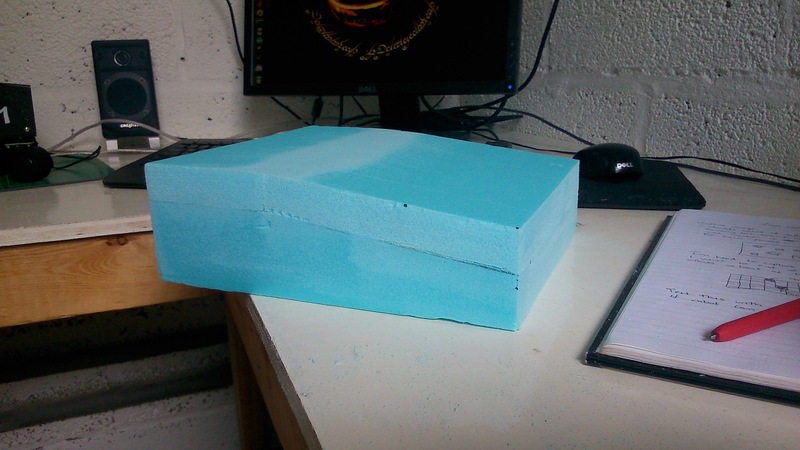 I have ordered some foam to carve into shape which can then be used to make a mould to create the carbon fibre piece. This will hopefully happen quite soon and I promise a blog entry outlining the process if it is a success! Meanwhile I have been developing some software for the robot. The TFT screen is attached to the raspberry pi, as are the tactile switches. A bit of time was spent working out how to use the SPI interface through python to send pixel data to the screen. I found this series of tutorials online that were very helpful http://w8bh.net/pi/TFT1.pdf. I can now write text to the screen and I have interfaced the buttons so that I can cycle through options on the screen and select what I would like the robot to do, or display sensor data. I have been thinking about what I would like the robot to do and a lot of it revolves around vision so that is going to be the focus of future work. Identifying targets to reach and obstacle avoidance to allow the robot to get to its goals are my main aims for the future. This robot came together very quickly. This was partly due to the fact that I had all the parts I needed already and partly due to this design being a relatively simple one. From my last post to having a robot ready to test took about 3 weeks. Since then I have been modifying software from my humanoid robot for use on a mobile robot. The parts that needed fabricating for my new robot included a base plate to mount everything to, new brackets for the wheel servos and encoders, a bracket for 3 sharp IR sensors, a mounting plate for the Arduino and a new pan/tilt arrangement for the camera and sonar sensor. I wanted to use 40mm castors at the rear of the robot as I have found these to roll really well on carpet. This lead to possibly the trickiest part of the design. I had to raise two sections at the back of the base plate to mount the castors to so that the robot was level and didn’t have a huge ground clearance, which may have made the robot look odd. 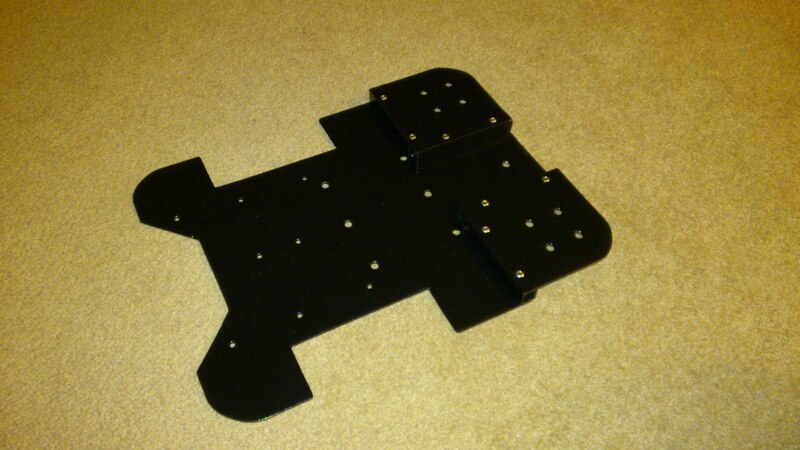 The picture below shows the finished base plate, painted black. The other brackets and components were fabricated and painted black as well. I decided to modify two servos for use in the head pan/tilt arrangement. I wanted to get a signal from the internal pot to use as feedback of servo position. 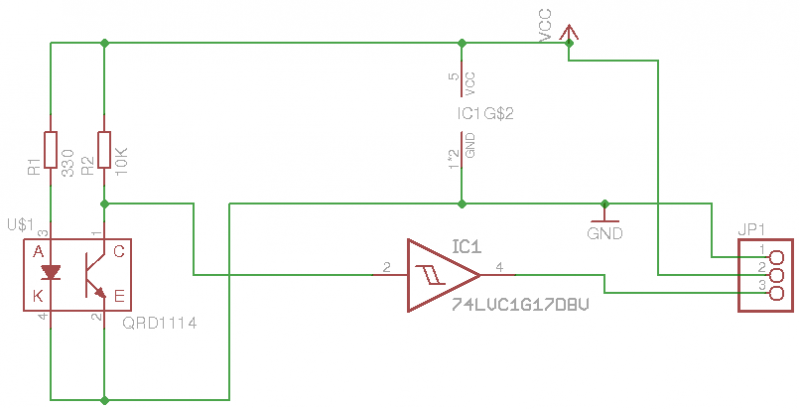 This involved opening the case of the servo and soldering a wire to the centre pin of the internal potentiometer, which can then be read by the Arduino via an ADC. I knew that this would not be as accurate as using an external potentiometer as I did with my humanoid robot but I was willing to make this sacrifice at this stage to simplify the mechanical design of the pan/tilt arrangement. With all the parts ready for assembly I took a picture of all the components laid out because I’m sad like that and I think it’s cool! The next task was to assemble the robot. 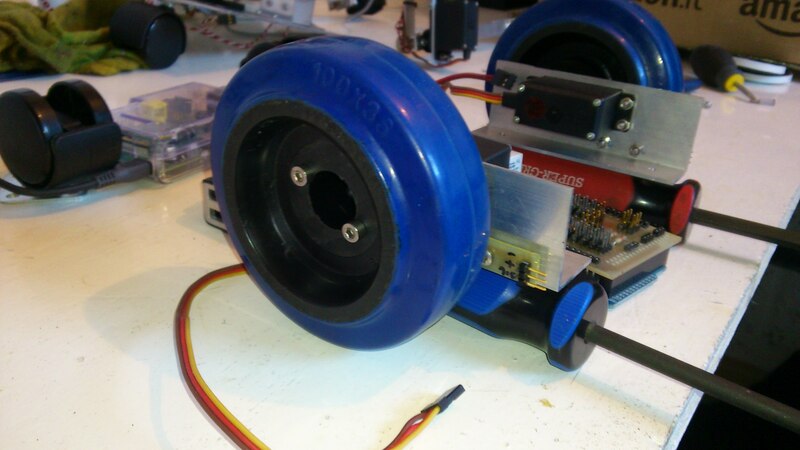 I also needed to make and attach encoder disks to the wheels. These were designed on the computer, printed onto card and glued to the wheels. The assembled robot is shown below. I still plan to make, or have made, a cover for the robot to hide and contain all the wires and electrical components. 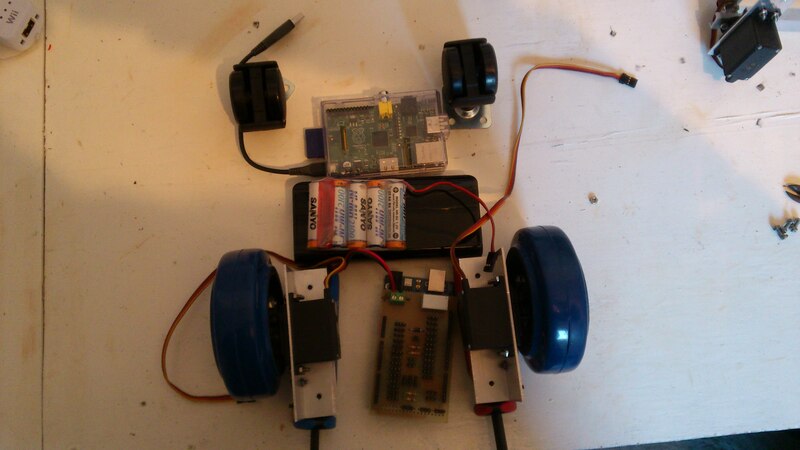 This is a work in progress but testing and software development can still continue on the robot as it is. At the moment I am still testing and modifying software to display data from the robot on a screen and control the robot manually from either a PC or the Raspberry Pi. My goal with this robot is to have several modes of operation that can be selected between. For example; obstacle avoidance, wall following, colour tracking etc. This is very much a work in progress but when I have something working I will make and post a video. That’s it for now, back to software! It’s a bitter-sweet moment, the start of a new project. On the downside, my humanoid project will be put on hold and the robot will be robbed of many of its parts. This project has run its course with me and I have found myself at a dead end with its progress. I was happy with the robot build and the software development I did, but its time for a new challenge. This leads me nicely on to the sweet side of the situation, the start of a new robot project! I am returning to mobile robots which I found to be a lot of fun. This project has some simple goals from the outset. 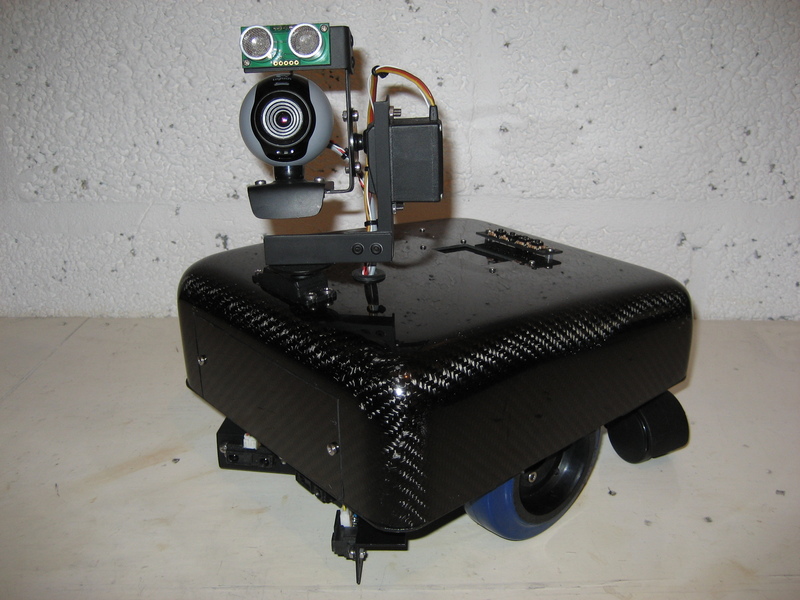 I want to build a sturdy, reliable mobile robot platform. Ultimately I want as many of the electronics and delicate components as possible covered or hidden away. The reason for this is a certain 14 month old chap that takes great interest in anything and everything and is currently learning about the world by testing things to destruction! I will be using many of the parts from my humanoid robot so I will be sticking with the Arduino mega and my custom interface board and the Raspberry Pi. I have purchased a new battery for powering the Pi, a 12000mAh lipo of the type used to recharge your phone when its battery goes flat. 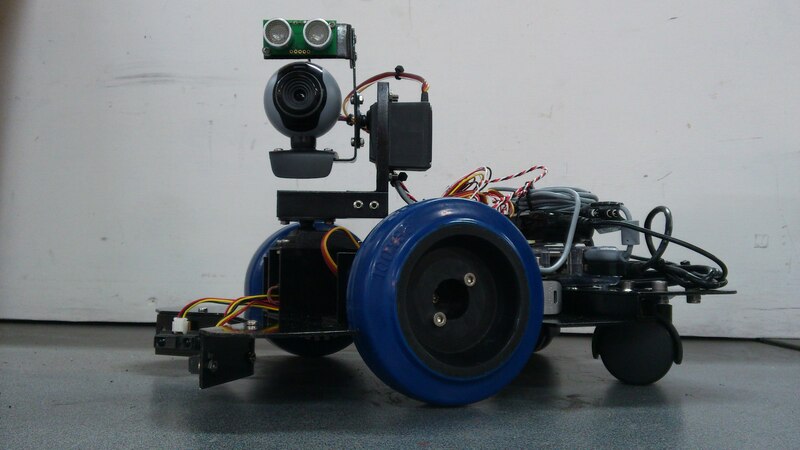 The wheels will be driven using modified servos with external encoders and for sensors I want to use a combination of sharp IR sensors, sonar and a webcam. My intention is to design and build an aluminium base for everything to attach to, and enclose the electronics either with a cover made from aluminium or possibly fibreglass or carbon fibre. It’s early stages but I have purchased some new wheels which I have machined to allow me to attach a servo horn. 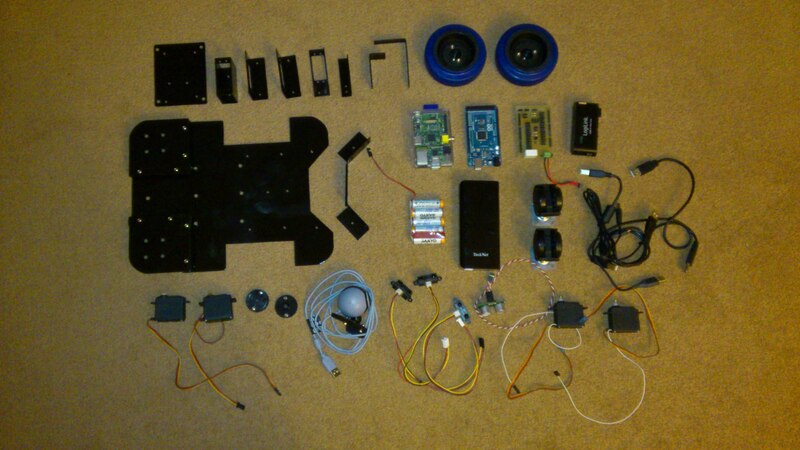 My humanoid robot has been robbed of many of the parts I need for this new project. I am currently in the process of designing the base plate but I have a couple of pictures showing a very rough outline of how everything may end up fitting together. The first picture shows the new wheels and the second shows the components laid out to help me visualise where everything will go. Plenty for me to be getting on with but I will be back with more as and when I make some progress. 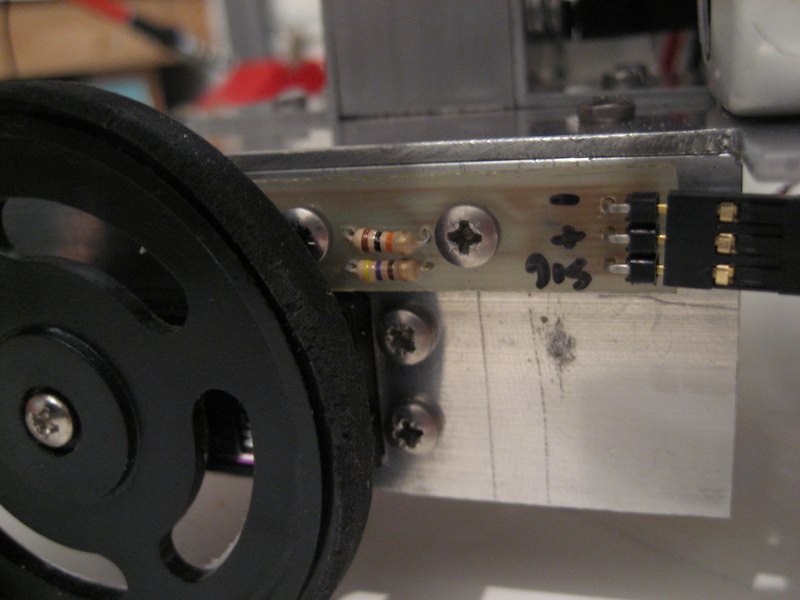 If you have read some of my previous posts you will know that the state of the wiring on my robot has been causing me distress. It’s not that the wiring was causing issues as such, it’s just that I knew there was a better way of doing it. My design had the Arduino board mounted on the base with many wires connecting it to an interface board mounted on the rear of the robots torso. 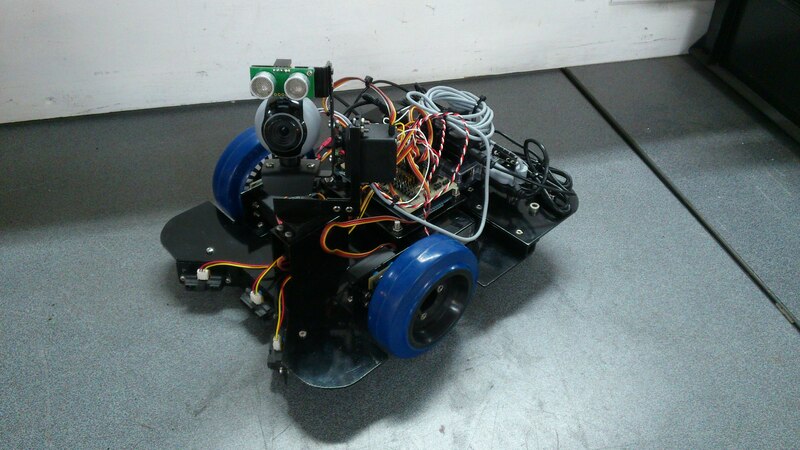 The better way to do it would be to use a shield that connects to, and sits on top of, the Arduino and mount the Arduino to the rear of the robot torso. So I set about designing and building a shield to meet my needs. I started with a template made by someone else, no use re-inventing the wheel. I used the one found here http://circuitfun.wordpress.com/2012/01/02/arduino-mega-shield-template-in-eagle-improved/, which I must say is very good! I then added parts to meet my requirements. 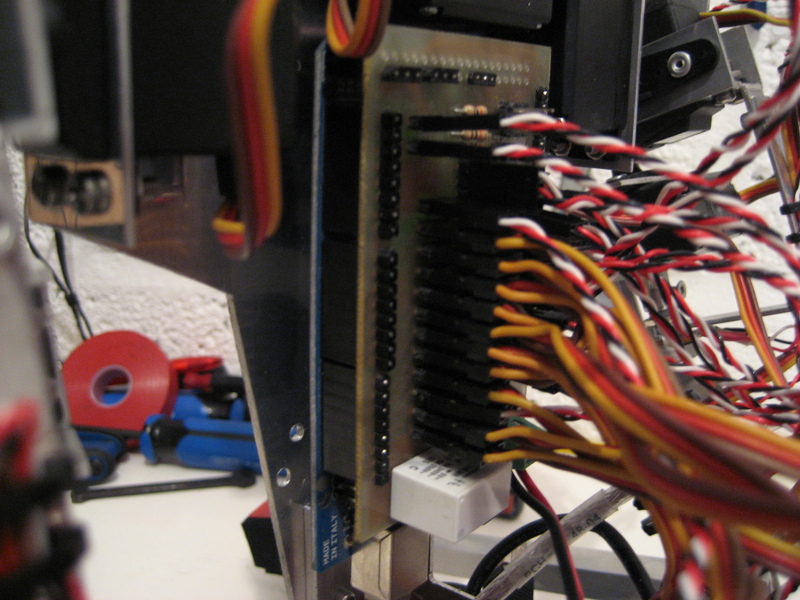 I added connectors for all of the servos, connected to the PWM pins. I also added connectors from the ADC pins to interface the potentiometers, with a few spare should I wish to connect anything else at a later date. Connectors from a few digital pins allow sonar sensors to be connected as well as the hand switches. As a bonus I added the servo power switch circuit to the shield so I could do away with the small separate circuit that was performing this task. I then completed the board layout and fabricated the board. Having completed the board and tested it I would say it was a worth while project. 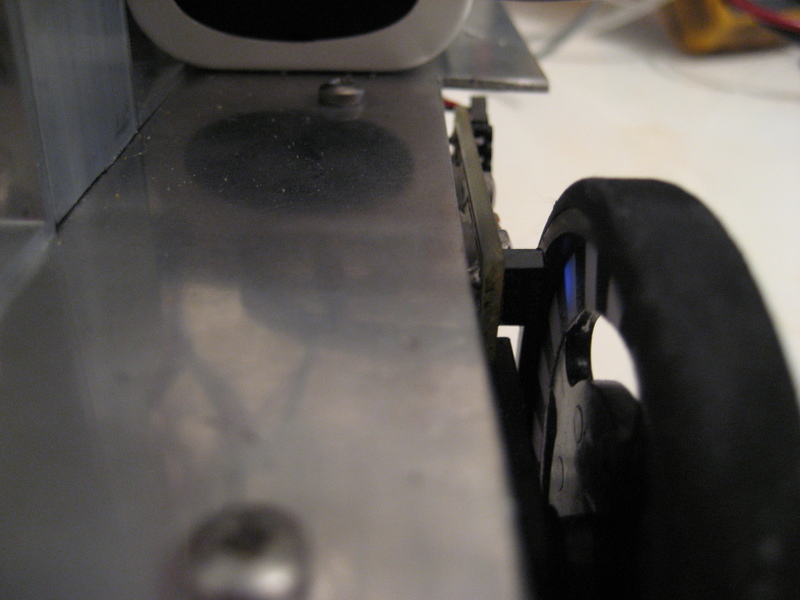 I have got rid of a load of wires from the rear of the robot and cleared some space on the base of the robot. I did have the batteries slung beneath the base which I didn’t like, so these have moved to the top of the base. All in all, this set-up is much tidier and this makes me happy. The picture below shows the Arduino and shield in situ. I have been thinking lately about a better design for the switches on my robots hands. The design posted on here previously simply used tactile switches mounted to the robots hands to sense when the hand came into contact with something. I always knew this had major limitations so a new design was needed. The biggest limitation was the small area of the switch, meaning it was a bit of luck whether the switch hit an object or another part of the robot hand did. What I really wanted was a hand design that would switch whenever the hand came into contact with an object, from any angle or direction. I also wanted the switch to trigger easily, so that the robot knows as soon as possible when its hand has hit something. I used these requirements to come up with a design that would do the job. 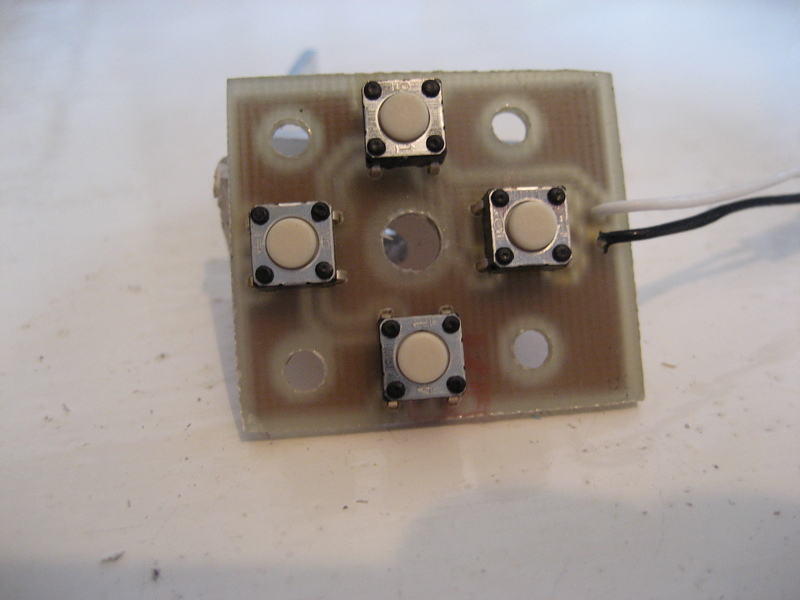 My new design still uses tactile switches, 4 per hand, on a custom made PCB. Have a look at the picture below to see the PCB. 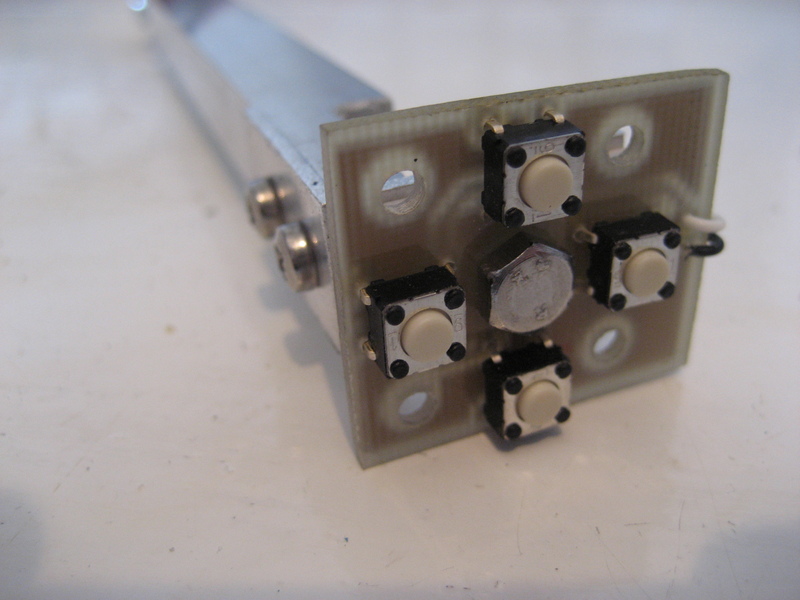 This PCB mounts to a bracket that is attached to the end of the robot arm, perpendicular to the arm. A piece of expanded PVC sits between the bracket and the PCB. 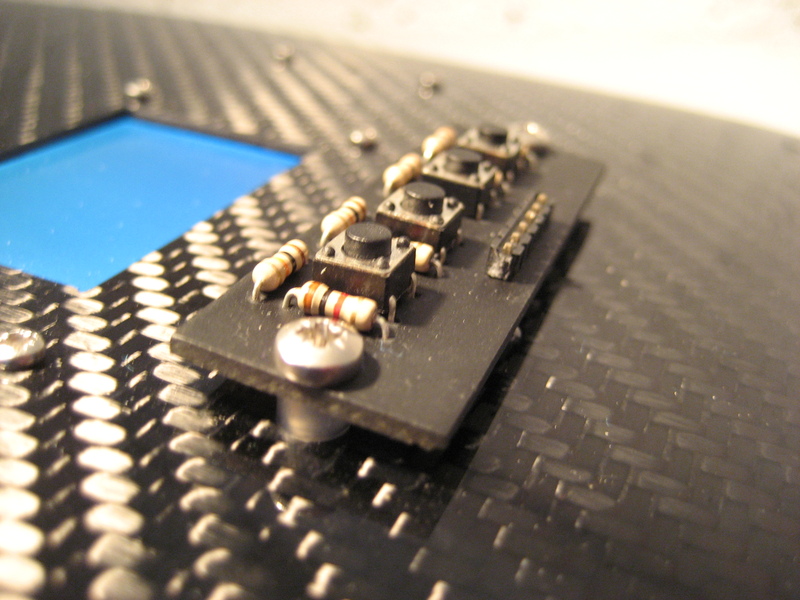 This provides electrical insulation and compresses slightly to keep the PCB firmly fitted to the bracket. 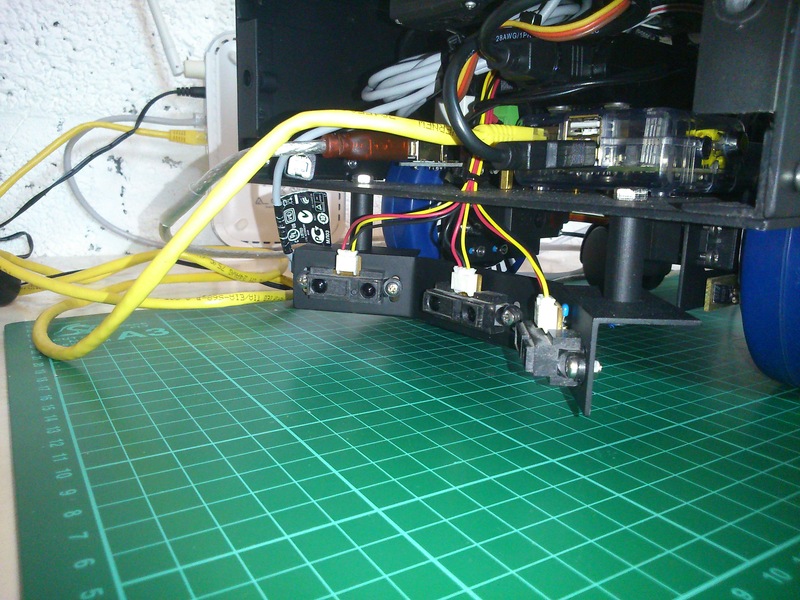 The mounted PCB is shown in the picture below. A second bracket mounts to the PCB but on the switch side. This bracket is held on with 4 bolts but is left slightly loose so it is free to move and press down on the switches. A U shaped section of aluminium completes the hand, attached to the second bracket. When the hand comes into contact with an object, the second bracket is pushed into the switches and triggers a signal to the Arduino. The picture below shows the final assembly, mounted to the robot. I’m very pleased with this set-up. I have done some simple tests and it functions perfectly. No false triggering and it only takes a small force on the hand to trigger the switch. The assembly is sturdy and should last a long time. I also think it looks quite good, if I do say so myself!